Showtime commentators dubbed it the “most significant women’s boxing match of all time,” although there are other contenders. 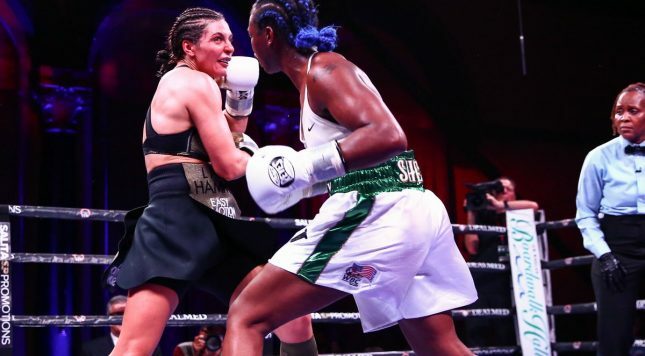 What was totally clear was who won Saturday: American middleweight Claressa Shields beat up German Christina Hammer, nearly stopping her late before taking a wide decision. Shields came in with the reputation of the roughhouser, deservedly. When it was jagged, a brawl, Shields flummoxed Hammer, forcing her to hold, making her complain to the ref for imagined fouls. But Shields boxed sharply, too. Her head movement was a blur; she stepped forward in a tricky fashion; her counter overhand rights were the best punches in the fight; she threw compact shots. Hammer did some of what she wanted in the 1st round, using her height and reach to control the action with a jab, although even then it was a close one. It rarely was thereafter. It didn’t take long for Hammer to realize that Shields was no one-dimensional brute, then she couldn’t realize much to do about it. By the 8th, Shields was in such control that she rocked Hammer and knocked out her mouthpiece. In the 9th, Hammer was dangerously close to getting knocked out. She survived the 10th. The judges all scored it 98-92, which makes you wonder what other round they gave Hammer — the 6th, maybe? So let’s size up what this means for women’s boxing. Shields has star power. She’s passionate, she’s a good talker, she’s got a compelling if tragic back story. “I am the greatest woman of all time!” she shouted at the fight’s end, a premature conclusion but the kind of confidence you want to see from someone representing the face of a sport. She then led the crowd in a chant: “What’s my name?” They obliged. What’s more, she proved — perhaps with some aid from trainer John David Jackson, a puncher’s trainer — that she can do some facsimile of the damage men’s boxing fans crave. But here is where we pivot to certain limitations. Shields still has just two knockouts in her short career, and her opponent had just 11 in 24 wins coming in. While there are some exceptions, women’s boxing doesn’t seem to net the kind of memorable KOs you see in men’s boxing. Some of that might be due to a difference in athleticism. It always feels sexist to say it, but at this point in human history, men for the most part in elite sports are, on average, the more explosive athletes. That makes a difference in the appeal of the competition. Another thing: Perhaps Shields scores the KO if the boxing match was set up on equal terms to a men’s match. Women fight two minutes in the pros to men’s three minutes. There doesn’t seem to be much support for this out there for this kind of infantalizing of the women’s sport, and this, too, limits the appeal. So here we had a network giving Shields vs Hammer a huge promotional bump, maybe the bump it deserved historically, maybe overhyping it a little. Yet if you were on Twitter Saturday night, the boxing crowd was split about 50-50 at best between Shields vs Hammer and Jaime Munguia, the #6 light heavyweight, against a man not ranked in the top 10. Women’s boxing doesn’t need to be equal in popularity to men’s boxing at this moment, of course. In an ideal world, maybe it is. But the WNBA has thrived (if not as much as the athletes themselves would like and certainly not as much as the NBA), perhaps with some overlap with the NBA audience but also by expanding into new ones. For now, it’s not so bad that we had a meaningful event that builds the sport toward that equal standing, however much longer it takes. And the good news is that Shields still has opponents who can help her build herself, and her sport. Currently the boss at 160 lbs., she called out 147-pound boss Cecilia Brækhus and Savannah Marshall, the only person with a win over her in the amateurs. If Shields can beat those opponents and keep showing growth, she’s going to lift women’s boxing to new heights.